​Beginning at the Builders' Training Center! Journey level tradeswomen will team teach with instructors at various locations in safety, carpentry, concrete, painting, plumbing, electrical and welding skills during this free camp. By the end of this week, Campers will have several projects to take home with them and show off the skills they learned. You may complete the on-line registration below, or print out the PDF Registration form by clicking on the Camp NAWIC logo at right, complete the form including contact numbers and signatures, and email it to Camp.NAWIC@kcnawic.org by Sunday, April 21. Or you may register your high school age girl using the on-line form below. Camp NAWIC Schedule Coming Soon! 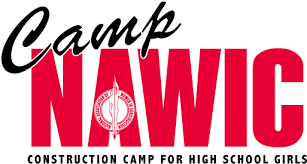 Click here for information on sponsoring Camp NAWIC 2019! Through a Company - please list below Through School - Please list below Through a Program like Boys & Girls Club, Girl Scouts, etc. - Please list below Previous Camp NAWIC Participant Other - let us know below! PLEASE READ: I give permission for my daughter named above to participate in all Construction Summer Camp activities scheduled for June 3rd - June 7th. I understand that there will be “hands-on” activities offered in the camp, and that a field trip is scheduled for Friday, June 7th. I understand that my daughter must have personal insurance coverage prior to participation in the summer camp activities. We understand that appropriate dress for construction is required. That includes jeans or khaki pants, close-toed shoes or boots and something to pull back long hair. I understand that Camp directors will make every effort to keep this summer camp experience educational and safe. I also give NAWIC and the Camp’s Company Sponsor’s the permission and authority to use my child’s picture or videotape for press releases and other activities that promote safety, job recruitment and retention, or any positive industry related event. I release the camp directors and National Association of Women in Construction (NAWIC) from liability for any physical injury that may occur. By clicking the Submit CampNAWIC Registration Now Button, you acknowledge the terms above.